Web features are a marketing tool conveying our core values and societal worth. 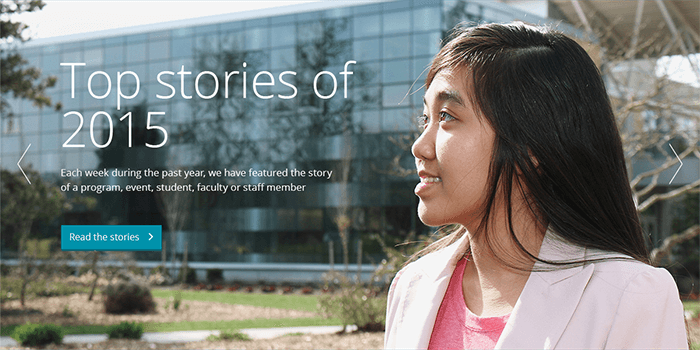 They tell the compelling stories of the people of PCC. By presenting a face that people can relate to, we hope to enhance the community’s interest and personal investment in PCC. an active participant in our diverse community. Headlines and descriptions do not generally use “PCC” or “Portland Community College” as part of the text. The home page already provides this reference. The subject has to be on the right, with a blank or blurred area on the left. Most of the time, we need to darken and blur the left side of the image to make sure the white text is accessible against the background. A slideshow displays the stories, with emphasis given to powerful, eye-catching images. 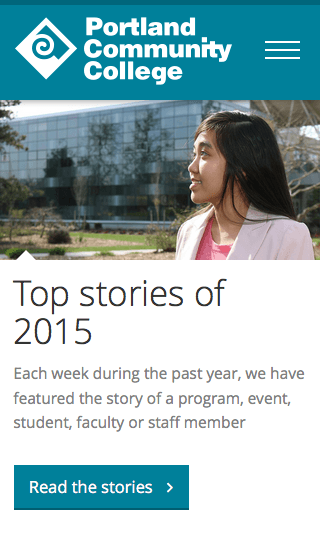 Users can click or swipe to see stories from the three previous week. WordPress supplies the photos, text and links dynamically. On large screens, the text and button appear on top of the image. On small screens, the text and button move below the image. The slideshow is always 100% width of the screen, and is touch-enabled.